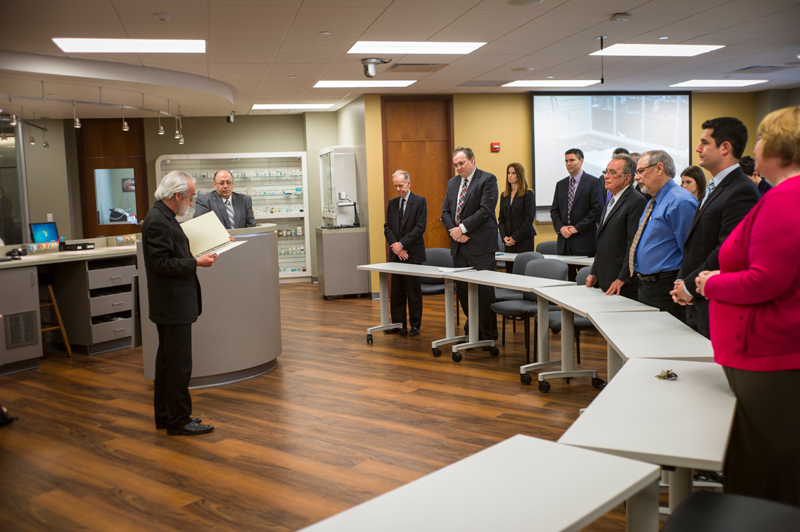 University and School of Pharmacy officials joined representatives from Giant Eagle for the formal dedication of the Giant Eagle Center for Pharmacy Practice on April 17 in the Bayer Learning Center. 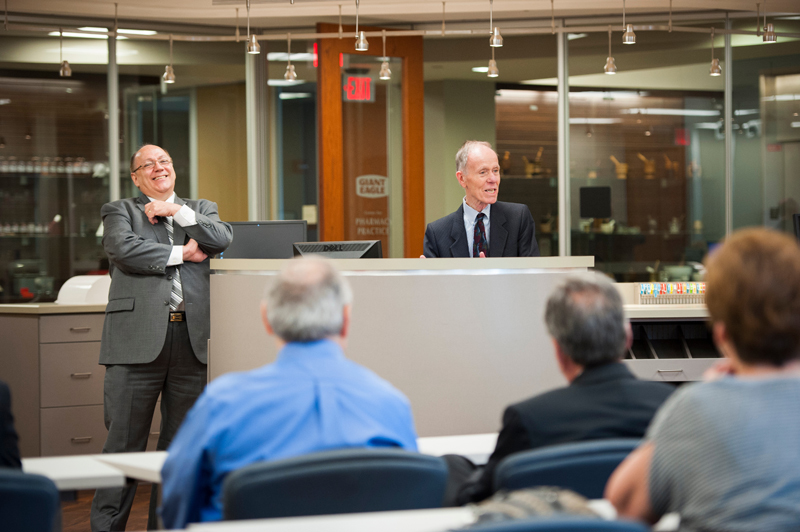 Pharmacy Dean Dr. J. Douglas Bricker and Provost Dr. Ralph Pearson both presented remarks at the dedication. "The support of Giant Eagle demonstrates to us that ours is a quality pharmacy program worthy of investment by community businesses," said Pearson. "We look forward to many more years of collaboration." Representatives from Giant Eagle at the dedication included John DeJames, clinical programs and special projects; Brett Merrill, senior vice president for health and wellness; Anthony Molleca, vice president for pharmacy operations; and Dr. A.J. Greco, Duquesne University administrative pharmacist with Giant Eagle Pharmacy. "I am very pleased with the commitment that Giant Eagle has made to the School to foster a learning environment that will prepare students for the practice of pharmacy as their role is changing within the healthcare arena," said Bricker. "Their support over many years is outstanding and is much appreciated." 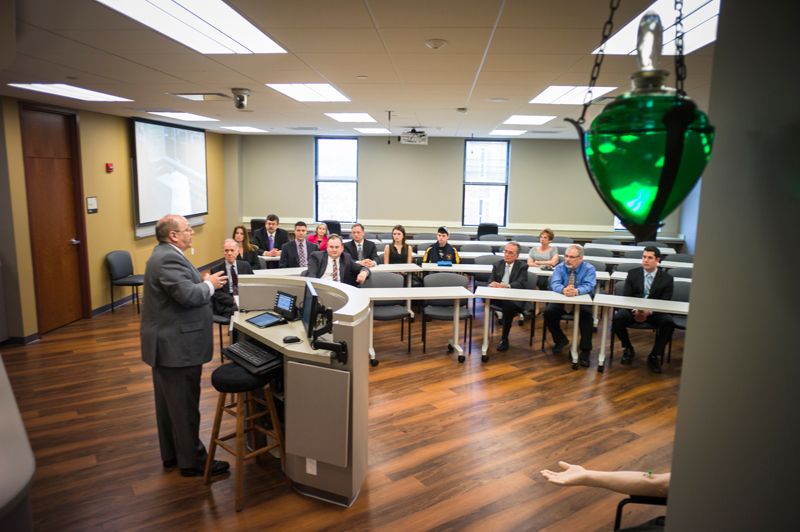 The Giant Eagle Center for Pharmacy Practice provides an environment that integrates, reinforces and enhances learning by showing pharmacy students the relationship between class lectures and pharmacy practice. The Rev. Ray French, C.S.Sp., director of Spiritan Campus Ministry, blessed the Giant Eagle Center for Pharmacy Practice.